This beautiful detached vacation home just outside the village of Le Vieil-Baugé (4km) has restored with a lot of love. You can feel that. On the terrace you can enjoy the tranquility. In the garden you can lie flat on one of the lounge chairs. Children will have great fun on the slide and the swing in the charming chambres d'hôtes on the other side of the road. By the way, it's some exquisite gourmet dining there! 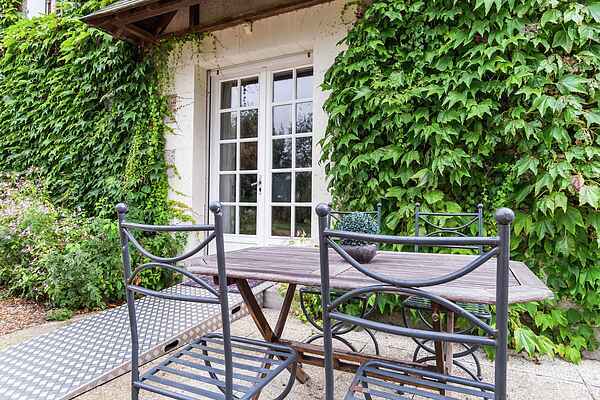 In Le Vieil-Baugé you'll find a bakery and a tennis court. In the beautiful Anjou it seems as if time has stood still. Villages, castles, vast forests and vineyards lie at your feet. Near the 15th century Château de Baugé (6km) you'll learn all about the inhabitants of the past. Remember to visit the historic, still equipped pharmacy here. You musn't skip Doue-la-Fontaine (25 km), \"the city of roses\". Very special here is Les Perrières, an underground network of cathedrals, basements and cave dwellings. You will do the children a favor with a visit to the zoo in Doue-la-Fontaine or Holly Park in Echemiré (7km). For a forest walk, go to Chaudelais (7km). A golf course, swimming pool, supermarket and restaurants can be found in Baugé.